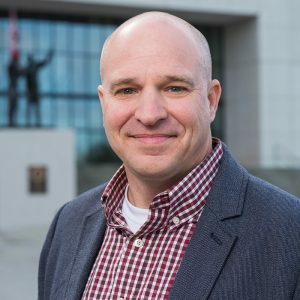 Dr. Michael Bruce, associate professor of journalism and creative media at The University of Alabama, has been elected president for the Broadcast Education Association. Bruce begins his one-year term at the conclusion of the BEA’s annual conference in Las Vegas, April 25. Bruce is the third BEA president from UA, joining Dr. Ray Carroll, who served as president from 1991-92, and Dr. Glenda Cantrell, who served from 2009-10. No other institution has had more than one BEA president among its faculty. During his term, Bruce will work to increase membership to the BEA, raise the visibility of academic research presentation opportunities and develop partnerships raising funds for creative scholarship within the association. Additionally, the BEA will become a leader in developing standards for comparing research to creative activity for faculty seeking tenure promotion through creative ventures. “My service to the organization stems from my appreciation for the numerous friendships and professional development opportunities I’ve been blessed with over my 24-year association with BEA,” said Bruce. Bruce serves the BEA as vice president for academic relations and formerly served as its secretary treasurer. He was also the first division chair of the sports division of the BEA at its inception in 2008. The Broadcast Education Association is an academic media organization made up of professors and students who serve to promote excellence in media education. The association provides platforms for scholarly presentation and production competition through its publications, annual convention, web-based programs and regional district activities. For more information about the BEA, visit its website. Source: The University of Alabama News.